"...not withstanding the storm Monday night, January 17, 1887, the opera house was filled by the local citizenry to show their gratitude to Mr. Sherman for his munificent gift of the Sherman Free Library and its privileges to the community." The original library collection contained about 2,500 books -- today the collection contains 11,000 volumes. The library offers a wide range of books for children and adults. In addition, there are books on tape and CD, music CDs, videos, and DVDs that can be borrowed from the library. There is also a reference section with materials pertaining to the local mining operations and the Adirondack region in general. In 1975, the Board expanded the library services by joining the Clinton-Essex-Franklin Library System. CEF provides access to other services, such as down-loadable audio books. Through CEF, the library is able to borrow items from other libraries, for our local patrons. The library has five computers for public use. Free Wi-Fi is available throughout the building. The library was placed on the National Register of Historical Places in 1995. The library's varnished oak interior remains intact. In addition to books, the library displays historic maps, photos and paintings. 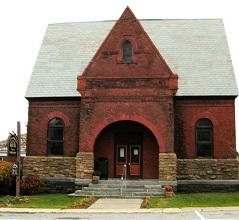 The library is governed by a Board of Trustees, which includes the Mayor of the Village of Port Henry, and the Supervisor of the Town of Moriah. The original endowment is no longer sufficient to support the library without additional funding from the Village, the Town, CEF, and our patrons. Go to www.cefls.org. Click on "Find Books," then click on "Search All Libraries." Type in the name of the author, title or subject you want. Check your spelling if nothing is found. It is not forgiving for misspelled words. (It is also possible that no library in the CEF system has the item. If no item is found, contact the library; we may be able to obtain it from other library networks). After you find the book you want, click on "Request Item" on the bottom right of the description. Enter the 14-digit barcode from your library card and your PIN number. You can obtain your library card and PIN number from the library. Click on "Request." Please limit your requests to 10 items. The CEF van delivers books to the library every Thursday and you will be called when the item arrives. The Sherman Free Library is looking for Friends! Love the library? Want to help out, but not sure how? Join the Friends of the Library group to assist with events, fundraisers, programs, and projects. Have a particular interest or talent? We're sure to have something you'll enjoy helping with. Call the library at 518-546-7461 or Jackie Viestenz at 546-9855. The Book Discussion Group meets on the third Thursday of each month, at 6 pm, (except for July and August; no meetings). Books to be discussed are chosen by the members; new members are always welcome to attend. "Zeitoun" by Dave Eggers; "And the Mountains Echoed", by Khaled Hosseini; "La's Orchestra Saves the World", by Alexander McCall Smith; "The Immortal Life of Henrietta Lacks", by Rebecca Skloot; "The Burgess Boys" by Elizabeth Strout; "Orphan Train" by Christina Baker Kline; "All the Light We Cannot See" by Anthony Doer ; "Blessings" by Anna Quinlan; The Boys in the Boat (crew team,1936 Olympics) by Daniel James Brown; Leaving Time by Jodi PIcoult; H is for Hawk by Helen Macdonald; The Invention of Wings by Sue Monk Kidd; The Goldfinch by Donna Tartt; Wolf Hall by HIlary Mantel; The Nightingale by Kristin Hannah; The Martian by Andy Weir; Dead Wake by Erik Larson; The Little Paris Bookshop, by Nina George. Books selected will be available through the library. PHONE: (518) 546-7461 or email shermanfree@yahoo.com.